"I don't think of myself as a historian or biographer," says the man whose biographies routinely net Pulitzers, and who could easily assume the mantle of America's Historian Laureate, if only there were such a role. "I'm a writer who's chosen to write about real people, and events that really happened. History is my terrain." David McCullough is speaking from his home on Martha's Vineyard, where he and his wife, Rosalee, have recently arrived from their place in Maine. It is a chilly green day in mid-June, and McCullough is answering the question that wasn't asked—the one his interviewer invited him to ask and answer. When he speaks he sounds just like…David McCullough. Clear and deliberate, the voice that etched Ken Burns's Civil War documentary into memory for so many of us, it is the timbre of a writer who knows how to tell a story. It is also a voice devoid of Pittsburghese, even though western Pennsylvania is where McCullough grew up. His family set down roots there back in the days of the American Revolution. George Washington once traversed its terrain (as a soldier fighting for the British, in the French and Indian War). How fitting for the writer whose terrain is history, and whose biographies have turned the founding fathers into something like highly articulate rock stars. "The closer one gets to the founders, the closer one feels connected to the ideals they stood for. Their idea of patriotism was what the word really was: love of country. It had a great deal to do with having faith in what the country they created stood for—government of laws, not men; freedom of expression and religion; the right to pursue life, liberty, and happiness. "But they were not perfect—perfect and human are contradictory. Nor did what they achieve result in perfection, especially when declaring all men to be created equal. "What they did was to give us the ideal to strive for. They didn't attain equality. But that doesn't mean we shouldn't keep trying. Each generation of Americans tries to carry the torch of that ideal." McCullough's choice of the word "torch" is telling. Back in the early 1960s, when he was in his twenties, McCullough fulfilled a dream he'd had since he was a kid and watched a movie where his film idol, Jimmy Stewart, went off to New York. After Yale, McCullough did the same, landing a job he loved, writing for Sports Illustrated. It was a wonderful life. "I felt I was answering a summons by a new president whose idealism was infectious and inspiring. Kennedy didn't say it was going to be easy. He said 'it will get harder; I need your help.' It was a particularly powerful summons, especially for young people. It affected my wife and me very much. "I had a very good job in New York, I liked it, and I put it aside and went to Washington. I didn't know anyone, I just went down and applied for different jobs. I ended up working for the U.S. Information Agency under Edward R. Murrow. I was in way over my head. But that's how you learn to swim." McCullough's job was as editor of the magazine that the USIA published for the Arab world: the Arabic equivalent of Life magazine. Being in Washington put him close to the Library of Congress, and one day a librarian there showed him and Rosalee the Library's newest acquisition. The Library had acquired pictures by a Pittsburgh photographer that chronicled the 1889 flood of a town not far from where McCullough grew up. And the rest, as the creaky cliché goes, is history—more specifically, McCullough's histories. The Johnstown Flood, published in 1968, became the first of his many great stories. When you know a bit of McCullough's own history, it's not surprising that something visual—the photographs—moved him so. "Nothing goes into a painting that isn't there for a reason. That's what a writer does, too. You can't put in everything you know. You learn what to include and what to leave out. "I love architecture and music, and they have a power because they surround you—you're inside them, not just looking or listening. When I write, I work in a book, not on it: I'm inside the subject. If I have to leave the writing for a few weeks, when I return I need time to get back into it." Watercolor is McCullough's medium, and he leans toward landscape and still life. When he travels, he often takes a small watercolor set with him, and will paint the view from his hotel window. But the canvas takes him farther than that. "I have at times done watercolors of settings I’m writing about—Truman's birthplace, for example, and the railroad station he left from to go to Washington. "I wanted to have that place a part of me. If you work on and study something for three to four hours, you never forget it: it's in you. When I'm writing about something I've painted, it's in me." McCullough's hands-on style of writing extends to reading—and holding—some of the books his subjects have, as he did with John Adams's copy of Cicero’s treatise on aging. He also held the original letters between John and his wife, Abigail. His experiential approach is what helps McCullough write "books that people of all kinds would want to read," as he says. He has certainly written books about all kinds of people—not only Washington, Jefferson and Adams, but also Harry Truman, Teddy Roosevelt, the men and women he profiled in Brave Companions, the builders of the Panama Canal and the architects of his beloved Brooklyn Bridge. His forthcoming book will be stories of Americans in Paris. So out of all the people he's written about, whom would he like to write the story of David McCullough? McCullough pauses. No one's ever asked him that question before. He wouldn't mind Trollope giving it a try ("he’s really good"). But McCullough hasn't written about Trollope. At least, not yet. 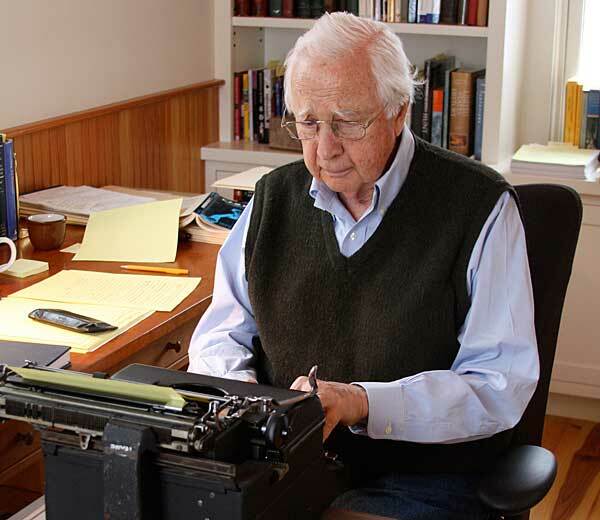 David McCullough uses the same second-hand typewriter he's had since the 1960s to compose all of his manuscripts. Levenger has re-created this piece of obsolete technology in the form of a bookend. It comes with McCullough's ode to his old-fashioned typewriter.